Paddington was a civil parish and metropolitan borough in London, England. It was an ancient parish in the county of Middlesex, governed by an administrative vestry. The parish was included in the area of responsibility of the Metropolitan Board of Works in 1855 and became part of the County of London in 1889. The parish of Paddington became a metropolitan borough in 1900, following the London Government Act 1899, with the parish vestry replaced by a borough council. In 1965 the borough was abolished and its former area became part of the City of Westminster in Greater London. Topographical survey of St. Marylebone, St. Pancras and Paddington Parishes. Engraving by B.R. Davies, 1145 x 950mm, dated 1834. 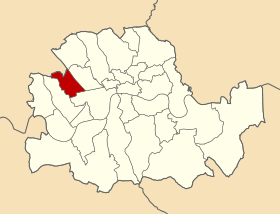 Its area covered that part of the current City of Westminster west of Edgware Road and Maida Vale, and north of Bayswater Road. Places in the borough included Paddington, Westbourne Green, Bayswater, Maida Hill, Queens Park, Kensal Green, West Kilburn, Maida Vale. To the south it bordered the Metropolitan Borough of Westminster, to the east, the Metropolitan Borough of St Marylebone. The borough was abolished on 1 April 1965 by the London Government Act 1963 and its former area merged with that of the Metropolitan Borough of Westminster and the Metropolitan Borough of St Marylebone to form the present-day City of Westminster. The borough council's coat of arms, granted by the College of Arms on 5 April 1902, was based on the former Paddington vestry seal. The seal featured crossed swords from the arms of the See of London passing through a mural crown, symbol of local government. To these were added the wolves' heads and blue background from the arms of the first Mayor of the Borough, Sir John Aird. Sir John, who was member of parliament for Paddington North, also donated the mayoral badge and chain. Azure, two Swords in Saltire proper pommels and hilts Or enfiled with a Mural Crown of the last. Two Wolves heads erased in Chief Argent. Paddington Town Hall, designed by James Lockyer in the Classical style, dated from 1853. The building, originally the Vestry Hall, was situated on Paddington Green. It was enlarged in 1900 and 1920. Following its closure in 1965, it was demolished to make way for the Westway urban motorway. The chair used by the Mayors of Paddington at council meetings was preserved, and is currently placed in the hallway at the Council House in Marylebone Road, the current meeting place for Westminster City Council. The war memorial, unveiled in 1924, was moved to the adjacent parish church of St. Mary. The building facade was retained and incorporated into a block of flats. Note that the population statistics up to 1891 exclude the area of Kensal Town transferred from Chelsea in 1900. 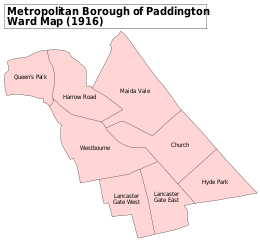 A map showing the wards of Paddington Metropolitan Borough as they appeared in 1916. Under the Metropolis Management Act 1855 any parish that exceeded 2,000 ratepayers was to be divided into wards; as such the incorporated vestry of Paddington was divided into four wards (electing vestrymen): No. 1 (12), No. 2 (18), No. 3 (18) and No. 4 (24). In 1894 as its population had increased the incorporated vestry was re-divided into six wards (electing vestrymen): Harrow Road (12), Maida Vale (9), Church (12), Westbourne (12), Lancaster Gate (15) and Hyde Park (12). The metropolitan borough was divided into eight wards for elections: Church, Harrow Road, Hyde Park, Lancaster Gate East, Lancaster Gate West, Maida Vale, Queen's Park and Westbourne. ↑ Scott-Giles, C Wilfrid (1953). Civic Heraldry of England and Wales, 2nd edition. London: J M Dent & Sons. p. 257. 1 2 Crossley, Richard (1928). London's Coats of Arms and the Stories They Tell. London: Robert Scott. pp. 162–164. 1 2 Beningfield, T J (1964). London 1900–1964. Armorial bearings and regalia of the London County Council, The Corporation of London and The Metropolitan Boroughs. London: Ed J Burrow & Co. Ltd. pp. 129–130. ↑ The London Gazette Issue: 21802. 20 October 1855. pp. 3879–3881. Retrieved 8 April 2015. ↑ "H.M.S.O. Boundary Commission Report 1885 Paddington Map". Vision of Britain. Retrieved 8 April 2015. ↑ The London Gazette Issue: 26526. 26 June 1894. p. 3671. Retrieved 8 April 2015. ↑ The London Gazette Issue: 26548. 4 September 1894. pp. 5150–5152. Retrieved 8 April 2015. Robert Donald, ed. (1907). "London: Paddington". Municipal Year Book of the United Kingdom for 1907. London: Edward Lloyd.